Newly-promoted Mablethorpe got their league campaign off to a perfect start with a 2-1 victory against All-Star Panthers. Mablethorpe did what they needed to grind out a result on a rainy day at Sherwood Fields. 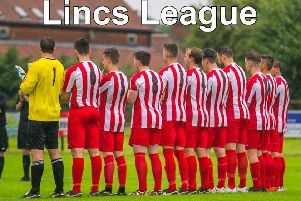 With key players missing this was an ideal start to life in East Lincs Combination Division One. Manager Mick Stubbs was pleased with both the performance and result: “This was the start of a big challenge in Division One and with players missing due to work commitments and injuries it was never going to be easy. Mitch Whiley gave Mablethorpe an early lead when his shot from outside the box deflected off a defender and into the net. Panthers responded with a couple of long-range efforts which struck the crossbar. At the other end, Adam Cannon was also denied by the woodwork when his shot brushed the outside of the right post. Then minutes before half-time Luke Turner fired past the keeper only to see his effort blocked on the line by a defender. Panthers had the wind advantage in the second half and created chances shortly after the interval. They didn’t take them, however, and conceded another goal when Whiley threaded the ball through for Cannon to slot home. Panthers pulled a goal back 10 minutes later from an in-swinging corner which was stabbed in at the far post. Soon after they were denied by Jamie Pittam, who made a brilliant save at the feet of an attacker. Panthers kept up the pressure in search of a late equaliser, but Mablethorpe defended well, making several blocks and interceptions to hang on for a narrow win. Panthers looked dangerous at times and were a bit unlucky not to take a share of the points, but Mablethorpe just about did enough to edge it by the odd goal. Stubbs added: “It was highly competitive in the middle of the pitch. Mitch Whiley, Danny Marshall and Lee Swift won that battle and were very strong. “Meanwhile Alex Carter played as a make shift centre back and looked like he had done the job for years. Mablethorpe are next in league action on Saturday when they host Barnoldby (kick-off 2.30pm). Mablethorpe (4-2-3-1): Pittam; Brownson, Carter (c), Billingham, Williamson; Swift, Whiley; Twigg, D. Marshall, Turner (Quinn 67); Cannon.